Mordian 7th Regiment: Heresy Era Thousand Sons - King Russ painting begins! Heresy Era Thousand Sons - King Russ painting begins! Got the tanks all kitted out last night, and since It was a beautiful day out while I was home over lunch yesterday I got the Vanquishers primed. After work I got the very first red basecoat on as well! ...There is also now red basecoat all over my hands, the desk and what has suddenly become exclusively a painting shirt (covered in liiiiiitle red spots). Whoops! Easy peasy, Vallejo Dark Flesh scrumbled on with a gnarly old tank brush. Next up will be the red gore/blood red highlighting and wash stages, which I'm sure are also going to prove to be very, very messy procedures! 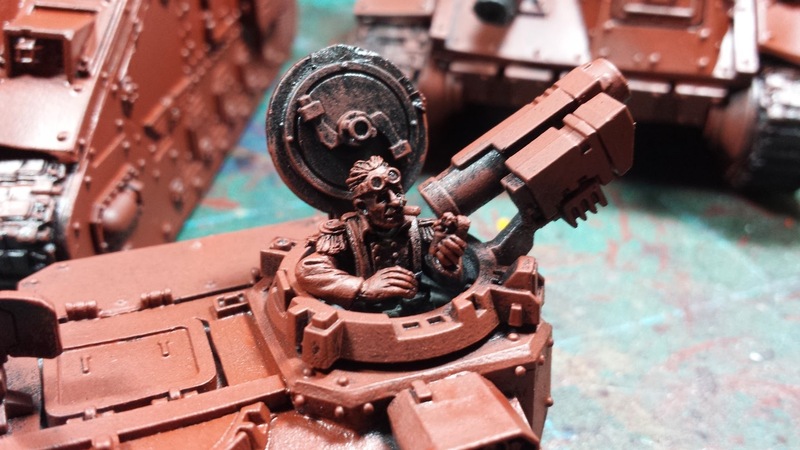 I wanted to go with a somewhat whimsical tank commander for such a squadron of solid, destructive machinery, so I used some arms and head from the Victoria Miniatures heavy weapons team set. Going to be interesting to paint, that zippo is TINY! The squadron weighs in at 552 points using the current Astra Militarum ruleset (or 622 if I'm feeling dirty and field them as Pask and an HQ squadron). To justify this heavy variant of the vehicle I'm calling it 'mandatory' that they take Extra Armour (of course) and pay the points for the Dozer Blade upgrade (re-roll difficult terrain) to represent their sheer weight smashing through the battlefield rubble. Even leaving off the side sponsons, once I add on the hull Lascannon and the hunter killer missile (because I love 'em), the 'base' King Russ is 200 points (a bit more for the commander's Augur array and some searchlights). Seems about right, I think. I need to snap a scale shot, let's just say I won't be accused of modeling for advantage when it comes to declaring cover saves! Cracking stuff mate. I'm kicking myself for not getting one or three of these back in the day. They look lovely. The Vics Mini piece is a splendid addition. So characterful. I'm wondering however if you might not want to use malcador, or even macharius stalines for the extra hull points to reflect the size of the monsters? O wow, those are great. Not seen the tank variant before though until now. Vic Lamb commander is inspired choice. I'd like to comment but I stand in awe of this unit. They are stupendously cool. @Frothing Muppet: Thanks man! I'm enjoying painting them so far! @Col. Ackland: I appreciate it, I've been saving them for a special occasion!